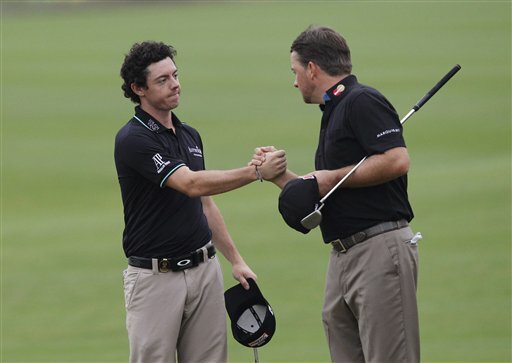 Rory McIlroy and Graeme McDowell shot a 4-under 68 in the second round Friday to give Ireland a share of the lead with Australia at the World Cup. The pair joined Brendan Jones and Richard Green at 13-under 131 overall after the foursomes’ alternate shot format in wet and windy weather on the Blackstone course at the Mission Hills golf resort on Hainan Island. "I think both of us are very pleased about the score that we ended up shooting today," said McIlroy, the second-ranked U.S. Open champion. "Anything in the 60s in the foursomes format is a very reasonable score out there." McDowell, the 2010 U.S. Open champion, is happy the format changes in the third round on Saturday to fourballs before reverting back again to foursomes on Sunday. "The alternate shot is much more difficult format," he said. "I’m looking forward to getting back out there into better balls tomorrow, where we can both play a little bit more aggressively and get into our rhythm better." Defending champions Edoardo and Francesco Molinari of Italy are tied for 10th after shooting a 69, and Edoardo later blamed China’s notorious restless and noisy crowd for their poor first round. "Yesterday we didn’t play very well," he said. "It was quite difficult to play with a lot of people with a lot of cameras around. Today was much better. We were much more focused on what we were doing. We just have to do the same and shoot a very low number tomorrow to give us a chance on Sunday." England’s Ian Poulter and Justin Rose are tied for seventh with Mexico and the Netherlands on 9 under. The World Cup features 28 teams and is being staged biennially following golf’s inclusion in the Olympics from Brazil 2016.